1. Notice was challenged AFTER the tax deed had been issued but before the purchaser held possession for three years. Property in question Sold to State at local tax sale in May 2004. The State issued a tax deed in July 2007. Complaint was filed June 2008. My non-legal mind makes me think that had the validity of the tax sale challenge (insufficient notice in this case) come after the purchaser had maintained possession for three years, he might have been in the clear. 2. The purchaser (CURRY) appears to have acted in good faith. As pointed out above, the purchaser seems to have “followed all the rules”, yet still incurred significant financial loss ($16,646.00). If the court ruled that the tax sale was invalid because of insufficient or improper notice, that liability falls squarely on the shoulders of the official charged with sending out the notices or advertising—-normally the collection official. Code Section 40-10-75 seems to make it clear that there is some liability on the part of the official. The purchaser (CURRY) can obviously pursue at least a couple of remedies: (a) take this to the Alabama Supreme Court or (b) take action against the official charged with noticing. For potential investors, the challenge here is how to protect any rents received during an interim period before a successful quiet title action. For collection officials, the challenge is how to maximize the legality of notice without exceeding budgetary constraints. Another recent interesting case for Alabama tax property investors (AKA “tax sale nerds”). 1. Evidence in this case shows that Mr. Ross was not a routine investor that just happened to get “snagged” on a misunderstanding of Alabama statute, but was in fact was attempting to execute a premeditated serial mission to postulate that his right of possession (on all the properties he had purchased) was not extinguished until he was reimbursed for non-tax expenses. This according to his interpretation of Code Section 40-10-122. The judicial system felt differently. 2. Thankfully, the courts showed their disdain for Mr. Ross’s antics by initially awarding punitive damages of $350,000. Later the Alabama Supreme Court reduced that to $120,000. I hope he got the message. You shouldn’t be able to simply IGNORE multiple court orders and get away with it. 3. I would not recommend that ANY property tax investor attempt to take possession on a CERTIFICATE interest except in the most unusual circumstances. Even then, Code Section 40-10-122 should be followed to the most minute detail. Note: A good synopsis of this case can be found here and here . This one got a little carried away with the process. Interesting (but long) reading for all you tax sale “nerds” out there. See this article about disappearing mortgages. Wonder how many have sold at tax sale? Yet another article about foreclosures nationwide. 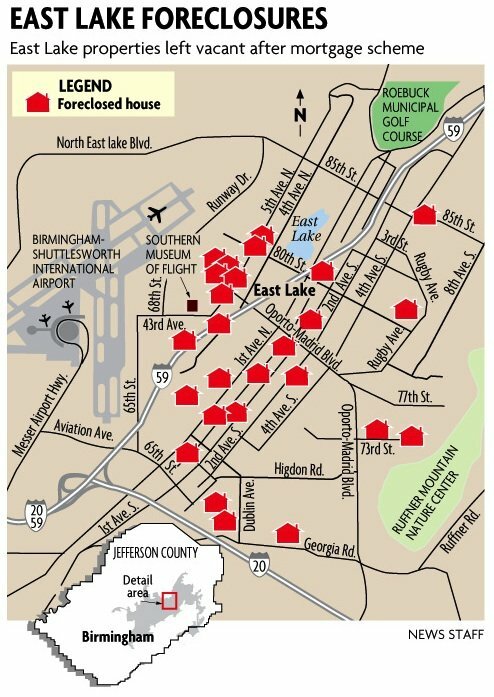 Here is an interesting article regarding the Eastlake area of Birmingham as it relates to investment properties.